VON ORMY — After nearly one year of construction, the aging northbound I-35 bridge over the Medina River has been replaced with a new bridge. TXDOT rushed the bridge replacement project through after observing excessive vibration, which engineers attributed to the age of the bridge (built in the 1930’s) and excessive weight due to the increase in traffic resulting from the Eagle Ford Shale oil boom. 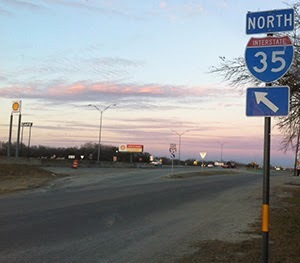 Crews were tasked with constructing a new bridge while not closing I-35. Construction however temporarily closed the I-35 on ramp just south of the bridge, which redirected access road traffic in the city south to Loop 1604. Among the business casualties of the bridge construction was Borrego’s Café, which closed operations this summer. There are no current plans to rebuild the southbound bridge, which is thirty years younger than the old northbound bridge.